What Do Actual Visitors to Dealership Web Sites Have To Say? Since starting in his new role at ADP Dealer Services, Ralph Paglia has been contacted by numerous people who worked with him prior to his retail position as e-business director at Courtesy Chevrolet in Phoenix, AZ from August 2005 through the end of March 2007. One of these business associates from the six years Ralph worked at The Reynolds and Reynolds Company is now a vice president at The Intellimark Group, which supplies a variety of products and services to dealerships throughout North America. It had been several years since Ralph had spoken with Rudy Martin when he contacted Ralph about the survey results Intellimark had aggregated based on over 5,000 completed questionnaires submitted by online consumers who had visited the web sites of dealerships served by Rudy’s company, Intellimark Group. 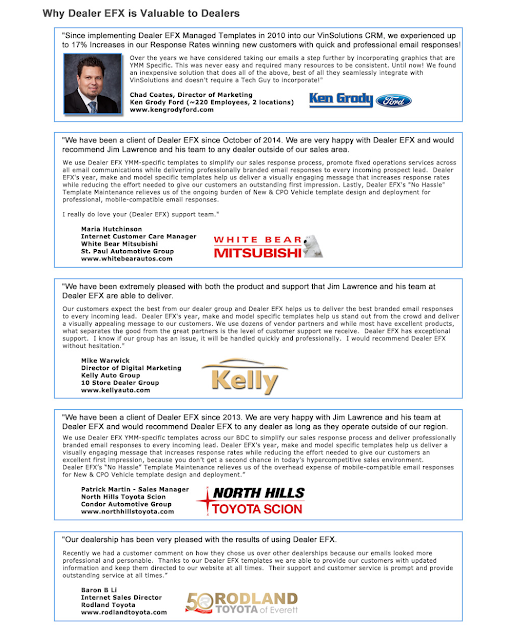 After discussing these aggregated survey results, Rudy agreed to collaborate with Paglia on producing this article which explores the insights gained from these visitors to dealership web sites.One of the more interesting results for readers who work in dealership sales departments is how people who visited dealership web sites responded when asked how soon they would be buying their next vehicle. For many of us who have been working with a mix of dealer web site generated leads and leads from other sources for awhile, this comes as no surprise. The data from this Intellimark survey validates the experience of most dealerships in finding that Internet leads coming in from their own web sites result in vehicle sales at a far higher rate than Internet leads from third-party producers and lead aggregators. If you are like me, when a customer says he will be buying a vehicle in the near future, you will want to know if there is a trade-in involved, without being overly transparent as to your concern over the customer’s trade-in situation. You might ask the question in this type of format: “Will you be replacing a vehicle, or adding another vehicle to what you currently own?” What the chart goes to show is that visitors to dealership web sites who are in the market for a vehicle are highly likely (67 percent) to be interested in the value of the vehicle they are replacing as a trade-in. Although some of these people may intend to sell or otherwise dispose of their current vehicle, there would still be a desire to see an estimated value. This helps to prove the value proposition of the industry’s two leading dealer web site trade-in evaluation tools, Kelley Blue Book’s LeadDriver and Black Book Online. So… you are probably wondering what these wonderful sales prospects may be considering for their next vehicle purchase. Well, you should be! The Intellimark surveys show that almost half of them say (before they buy) that they are interested in a new vehicle. However, of the 51 percent that do not indicate interest in a new vehicle, 16 percent are undecided, or what I like to describe as “open-minded.” Their actual purchase of either new or used is usually based on situational opportunity factors including price and availability. With over 35 percent of dealer web site visitors saying that they intend to buy a pre-owned vehicle as their next purchase, and 51 percent stating right up front that they are not interested in a new vehicle for their next purchase, it makes sense to consider putting an emphasis on used vehicle specials as featured content on dealership web sites. With so much emphasis and effort being made on competing in the hyper-competitive new vehicle sales arena, this data suggests that an equal amount of effort in promoting used vehicles may yield a higher return since used vehicles are somewhat more unique, and less of a commodity than new vehicles. Dealer web site visitor responses show there is a huge opportunity to drive more traffic into dealership web sites using integrated marketing campaigns. Integrated marketing campaigns are those that include both conventional media and online digital marketing. Despite the current situation of few dealers focusing on using advertising to specifically drive customers to their web sites, 44 percent of the Intellimark surveyed dealer web site visitors indicated they got there as a result of dealership advertising in non-digital conventional media sources such as TV, radio, newspaper and direct mail. What is glaring to me is the low percentage (14 percent) of dealership web site visitors who got there using a search engine. These survey results indicate that there are significant areas of opportunity for dealer web site traffic growth using search engine marketing (SEM) and digital advertising campaigns (DAC). When we break down the data within the Intellimark survey within the categories of those site visitors who say they intend to get a new vehicle, versus those who indicate they intend to get a used vehicle or are undecided (open minded), we get a clearer picture of what is important to these web site visitors and what each type wants. For example, among those that indicated they intend to buy a used vehicle, or are open minded about their next vehicle purchase, we wanted to see what type of vehicle they were most likely to consider. Understanding these intentions helps to guide us on what to feature in our online specials and when we advertise on other web sites to attract more traffic. The high interest in passenger cars shown in may have been influenced by the last two years of sustained high gas prices. This survey result also shows why the domestic auto industry’s continued emphasis on trucks and SUVs is not generating the level of interest we experienced prior to 2005. So, what is most important to these buyers? The Intellimark survey of over 5,000 visitors to dealership web sites shows that price and payment are still king, with fuel economy rising to third place and overtaking the previous perennial favorite, vehicle safety. We see what the dealer web site visitor who is either undecided on new versus used, or has indicated they want a used vehicle indicates are the most important decision criteria used to determine the actual vehicle they will end up buying.We see that the most effective advertising may be that which features monthly payments, followed by selling price. I know, very few of you are surprised. So, why do we continue to place advertisements intended to drive traffic to dealer web sites that do not feature payments, price or even fuel economy? I am guilty of thinking that availability was a key motivator, as in the outdoor advertisement shown in the image to the left.Looking at the results of these Intellimark surveys, it is no longer a mystery why the ad shown above seemed to drive so many more web site visitors and phone calls than the “largest inventory” advertising campaigns. These considerations, what to advertise and which message will get the most attention are the issues best served by surveys such as what Intellimark Group has put together. After all, if the message doesn’t hit the car shopper’s hot spots, then it won’t get their attention amidst all the clutter that is out there today.Which brings me to another interesting insight from Intellimark’s survey research… What are the most significant factors in deciding what to buy and when to pull the trigger? Of course, this is based on what car shoppers say is important, and anyone who has sold cars long enough will tell you that how buyers act is often different than what they say they are going to do. Still, there is a lot of value in studying what car shoppers believe are the reasons they will decide on a particular vehicle or deal. With that said, there are a lot of differences in what motivates vehicle buyers depending on the vehicle type they are considering. It is interesting to note that once again, monthly payments and vehicle selling price are the two criteria that car buyers report as being the most important consideration when buying a specific vehicle. Fuel economy is more significant than at any time since the Arab oil embargoes of a generation ago, especially for passenger car and commercial vehicle buyers. Surprising to me, coming from a vehicle sales background, is the low level of importance placed on vehicle styling. Of course, once again I would like to remind readers that these are what car shoppers “say” is most important and how they actually end up buying may or may not correlate to what they said before they make their purchase. But, this still shows us what these online visitors to dealer web sites report as being most important and what will get their attention more effectively than other criteria.One of the many factors to consider when looking at these Intellimark survey results is that these are online shoppers who are very deep into the sales process funnel. These are people who will be buying a vehicle fairly soon and may have already gone through the process of determining what type of vehicle they will be getting next. For these reasons the degree of importance placed on price and payments may be far more significant than people further away from their next vehicle purchase, who have not yet determined the type, make or model they are most interested in. After all, when interviewing people who have already found your dealership’s web site, how likely would it be that they have already decided on a make and model and are now looking for the right deal, salesperson, convenience and financing terms? The results of this Intellimark survey of dealership web site visitors may not be too surprising to many people, but they do confirm that most dealerships will be better served by generating more visitors to their store’s web sites. When considering the ways we can most effectively drive traffic to dealership web sites, it is highly logical to look at what consumers who have already visited our sites say is most important to them. Then we can use those most important criteria as a means of deciding what is most likely to work in trying to get more of an already good thing; the car shoppers that visit our dealership’s web sites. Ralph Paglia is the director of Digital Marketing for ADP Dealer Services. Rudy Martin is vice president and general manager of the Intellimark Group, a division of Rocket City Automotive Group, Inc.